Many of you might not know GoPro Company is going down the hill. Their recent Hero 6 has not got many reviews. So is GoPro Hero 5 Session worth getting it? There are many cheap action camera out there almost as good as GoPro Hero 5 but the Session 5 is different from all the others. It is small and compact compare to all action cameras. It shaped is a compact square and others are more bigger in rectangle shape. 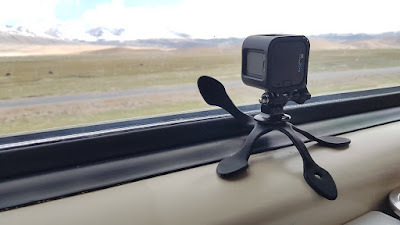 My current GoPro Hero 5 Session is almost 2 years old, so far it has been to Tibet and Singapore which I have made many food videos with it under another Blog Without Borders. At this moment GoPro stopped production of the Hero Session but you can still can get it on eBay as low as USD195. GoPro Hero 5 now sells at USD299. After all this years, I really love the small form factor of this action camera, the 4K recording is a bonus but for better digital image stabilization I have to drop to 1080p. The colour quality is pretty decent, enough to make Youtube videos which can upscale to 4K using 3rd party video editing software. At the moment when I am up on an adventure, there are only 2 cameras in use, my Samsung S9 and GoPro Hero 5 Session. Clips on the GoPro will be transferred to my Samsung S9 using OTG cable for editing. The software I used is PowerDirector Paid App, it takes about 30 to 45mins to edit the video and later video is uploaded to YouTube and the rest of the clips are transferred to my 1TB Seagate Slime Drive. Basically I do not have to bring a laptop, all is done from my Samsung S9. Here is a video made using GoPro Hero 5 Session recorded in 4K but downscale to 1080p. Just view and listen to the sound quality, the mic is from the GoPro itself. In making this video, I used my smartphone as a second screen to capture the angle of the shots. Overall I find it is good action camera that suits my need. The battery life is around an hour and I am using 64g ScanDisk Ultra Micro SD card. On my Samsung S9 I have a 128g SD card so I can transfer all the 64g file to my phone for editing. GoPro Hero 5 Session is a waterproof camera up to 10m, it is small and the recharging time is around 3 hours but I do charge before the battery runs out. So to me battery duration is not a problem. GoPro Hero 5 Session is currently my smallest setup. What are you views on this little camera?